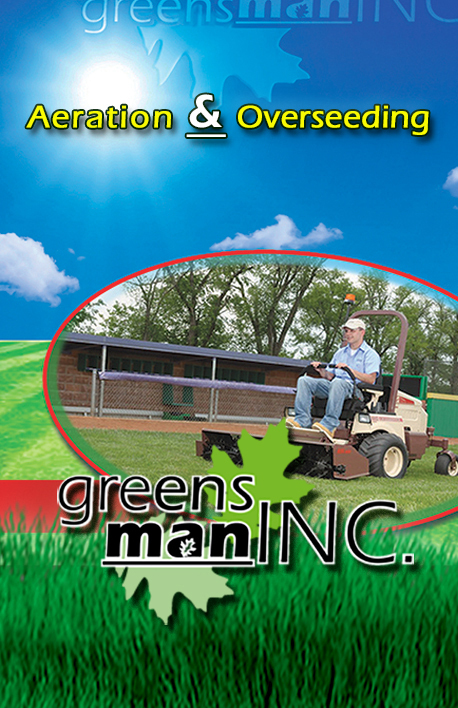 Greensman Inc. offers aeration and over-seeding services in the fall. Compacted soil and heavy thatch can cause serious problems in your lawn, especially during the hot dry summer, and aeration is the best method of correcting this. Over-seeding can be done along with aeration, usually to thin and damaged areas. Compacted soils stunt turf roots resulting in a lawn poorly suited to handle drought. Compacted soils have a low oxygen content and will repel water when dried out. Aeration breaks up compacted soil, improving the soil’s ability to absorb water and oxygen, and consequently improves root growth. Thatch is an undecomposed layer of roots and stems that lies between the soil surface and the green top growth of the turf. A thin layer of thatch (1/4-1/2”) is beneficial to the lawn, protecting the roots from extreme heat and cold. Over 1/2” of thatch creates a problem by acting like a sponge and robbing the grass roots of moisture. Heavy thatch also serves as a prime breeding ground for lawn damaging insects like chinch bugs and bill bugs. Aeration will improve microbial activity in the soil which results in breaking down the thatch naturally. Owner operator Doug Tronge is a certified arborist. We will make sure your tress as well as your lawn are healthy and vibrant.